This is not an article about the assassination of Pres. John F. Kennedy 50 years ago today. It’s not even an article about gun control, terrorism, or the other most likely topics for me to write about on the anniversary of a political assassination. This is an article about conspiracy theories, the US intelligence community, and why the lone gunman explanation for JFK's death will never be widely believed. This is the story of how the CIA became what it is today: one of the most universally feared, and hated, agencies ever established by the US government. 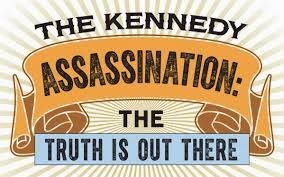 In case you haven’t noticed the flood of statuses, tweets, and articles on the internet today, JFK’s assassination still elicits speculation, political vitriol, and tales of schemes and plots, even half a century later. More than half of US citizens don't believe that JFK was killed by Lee Harvey Oswald alone, and many of those doubters point fingers instead at the Central Intelligence Agency. The shadow games played by the young CIA (note that the Agency wasn’t formed until after WWII) seem to have forever tarnished the Agency’s reputation: no matter what, there will always be those that think the Agency was behind JFK’s death, and every significant world leader’s death or terrorist attack in the last 50 years, for that matter. While the United States grapples with a solution for the military transition next year in Afghanistan, reaching a deal with Iran on their nuclear program, and (still!) managing the fallout from NSA revelations with international implications, Venezuela seems to have gone under the radar or perhaps has simply not been deemed a high enough priority these days. Should it be though? Venezuela is certainly no friend of America’s, and hasn’t been for years – former President Hugo Chavez, who died this past March, was constantly and publicly cold towards the United States. However, Venezuela is worth keeping an eye on more than ever today, due to the outspoken aggressor that is President Nicolas Maduro and the state of his economy. It was reported today that the Venezuelan assembly narrowly passed a measure giving Maduro what are known as “decree powers” – that is, enabling Maduro to unilaterally create laws without the oversight of any legislative body. Talk about frightening: the man who has publicly referred to his opponents as “capitalist parasites” and frequently mentions his plan to fight and win the “economic war” now has the unchecked power to do so. This drastic measure is in response to an existing – and already severe – problem. Venezuela has been experiencing historic inflation lately, at an annual rate of 54%. 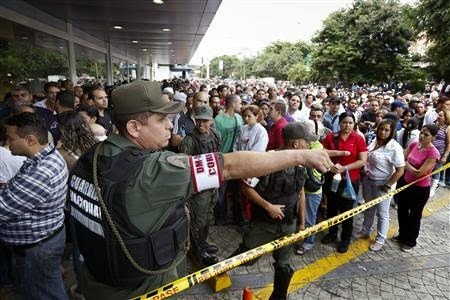 Along with one of the highest inflation rates in the world, Venezuela has severe shortages of many necessary items, such as toilet paper, and essential cooking supplies such as sugar, oil and milk. Economically speaking, the country is dangerously close to a freefall, where perhaps not even the shock therapies that have been implemented in countries such as Bolivia in the 1980s or Eastern Europe after the Cold War will be enough to mitigate the damage. Maduro, however, is not the answer, and nor are his policies. Recently, the Maduro government took over a chain of electronicstores, demanding the stores to sell their products at egregiously low bargain prices. Maduro claimed that these “capitalists” had excessive profit margins too high, and that clearing out their inventory by selling at discounted prices would stimulate the economy. This was before Maduro had been granted “decree power” – imagine what laws he may implement now that he has that power. Besides the economic impact this could have on the international market, these conditions, sustained in a country long enough, that breed disillusionment among citizens and ultimately, spawn terrorist cells. South America knows all too well the perils of having a dictator-like government and a barely functioning economy: the 1970s and 1980s historically were filled with various terrorist organizations from Bolivia to Peru to Colombia (and even Venezuela) that resulted in millions dead and violent government changes. Today, with more global connectivity than ever before, the threat of terrorist influence in Venezuela should be taken very seriously by the United States. 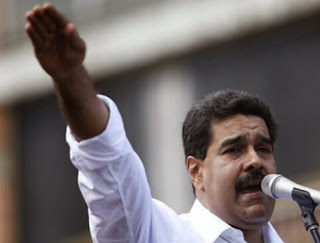 Nicolas Maduro has “decree power” for one year – it will continue to be important to observe the repercussions from the sidelines as he inevitably spins Venezuela’s economy further out of control. It is, in relative terms, old news at this point that the Philippines were struck this weekend by one of the strongest typhoons to date. 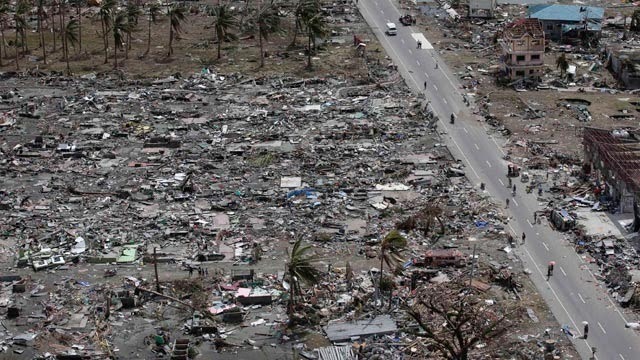 Several days removed now, the death toll is perhaps in the tens of thousands (currently, the death toll is just under 2,500 but that number is expected to continue to rise), and the damage inflicted upon the archipelago is unprecedented. Hundreds of thousands of survivors are without shelter, food, or other essentials, and, most frighteningly, the damage is still only being surveyed. The world has faced its share of natural disasters - Typhoon Haiyan has brought to mind for many the tsunami that decimated Indonesia in 2004 - but sadly, the international response is not always the same. Many critics have been quick to point out that the humanitarian aid provided to the Philippines has been minuscule up to this point. Washington, for its part, has pledged $20 million to help aid victims, in addition to sending warships and other personnel and support. The UN has asked for a total of $300 million, which it has not come close to receiving thus far. The aid that has been provided is being administered poorly, or too slowly - remember, there are countless who have been left with nothing, and are nervously awaiting assistance. Contrast this to 2004. I understand the differences between the two disasters (the final death toll after the tsunami was roughly 275,000, with millions displaced), but let's look at the differences in international response nonetheless: on January 1, 2005 - six days after the tsunami made landfall - approximately $1.8 billion had been pledged in aid, and a coalition formed by Australia, India, Japan, and the United States in order to coordinate efforts and ensure that quick and efficient aid was administered. Looking at this, its easy to be disappointed by the response thus far to last weekend's tragedy in the Philippines. But there are other variables to look at that are equally saddening. Because of rampant corruption in the Philippines, the domestic response to has been lackluster. This is further exacerbated by an astoundingly insufficient infrastructure system - poorly developed buildings and even entire neighborhoods stood no match to Haiyan, and a virtual lack of communication (keep in mind, the Philippines consists of roughly 17,000 individual islands) rendered each individual community on its own. 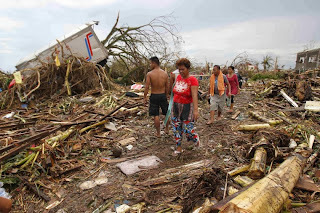 There is no such thing as a storm warning system, and apparently little in place to handle these types of disasters, and this is all despite the fact that the Philippines is directly in the path of typhoons every year. This is not their first, and most likely not their last time handling the aftermath of one. In places like the Philippines, more needs to be done in terms of storm preparation and investments in infrastructure such as seawalls, sturdier buildings, and improved communication networks. These are long-term strategies, which will be difficult to execute should money continue to flow to corrupt politicians in the Philippines when it should be funding important projects. Nevertheless, these are the sights that all eyes in South Asia should be set on. In the meantime, the international community should stand up and support the victims of such horrific devastation. With any luck, the Philippines will get back on its feet even stronger than before, but not without the assistance from world powers. Let's hope the aid continues to flow and we see less despondency in the Philippines - until then, I know that I will be thinking of them. It goes without saying that individuals can help too. This article by NBC does a good job of listing the various organizations taking donations and providing disaster relief. I've already donated, and you should too. 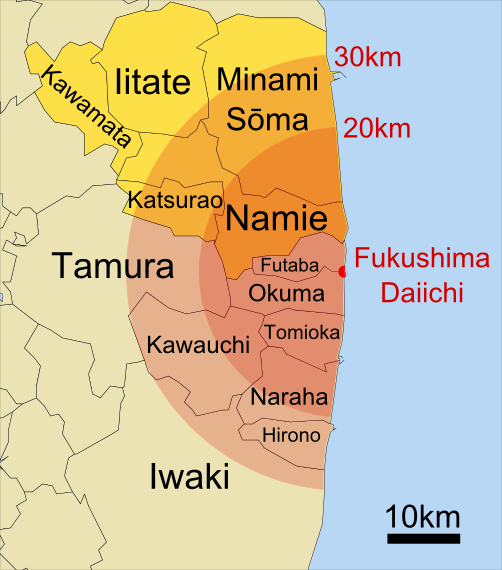 Just two weeks ago off the coast of Japan’s eastern region, another earthquake and subsequent tsunami hit the home to the Fukushima Daiichi nuclear power plant amidst a nuclear cleanup effort. Although no damage was reported from this tsunami, the news underscores fears that the risks of the cleanup effort—both foreseeable and unpredictable—threaten the nuclear power plant’s safe removal of nuclear rods, disposal of contaminated water and decommissioning. It seems that the delicate cleanup effort is far from over. of coolant failed, releasing toxic radiation into the Pacific Ocean and the surrounding areas. These events constitute the worst nuclear disaster since Chernobyl in 1986, as current radiation levels reach up to 30% of those of Chernobyl and left 18,000 people dead or missing. Last month, unexpectedly heavy rains hit the eastern coast of Japan, resulting in serious environmental and health impacts and the evacuation of roughly 300,000 people from the area. Excess rainfall caused tons of contaminated water from the plant’s cooling system to overflow into the Pacific Ocean. While the full extent of the damage is not yet known, the initial meltdowns in 2011 followed by a string of incidents leading up to the toxic spill have ignited fresh concerns over Japan’s nuclear future and the clean-up plan for Fukushima. 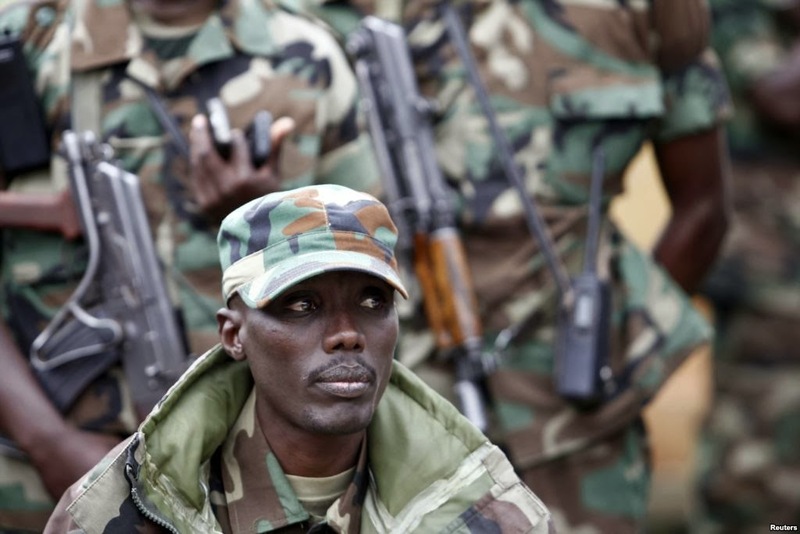 After over a year of conflict, there is likely a sigh of relief today in the Congo as the infamous M23 rebel group and their leader surrendered in Uganda earlier. General Sultani Makenga and approximately 1,700 of his rebel troops surrendered following peace talks that have not been successful in securing a cease-fire – Uganda has been in charge of brokering peace between the Congolese army and the rebels since peace talks began. Most likely, Makenga chose to surrender across the Ugandan border for fear of prosecution in the Democratic Republic of the Congo, with hopes that Uganda would not extradite him. 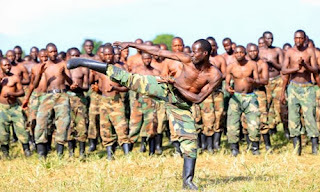 Makenga is subject to numerous UN sanctions, and is considered a wanted man by the United States government for his alleged use of child soldiers in his rebel movement. M23 began their campaign against the Congolese government in April of last year, and at the height of their power, had taken over several major cities in the Congo. A death toll is uncertain, but what is certain is that, like other similar situations in Africa, this conflict resulted in untold misery for thousands of families all across the region. The conflict even drew the ire of the international community when a UN report alleged that Rwanda had been secretly providing aid in the form of weapons and food to the rebels. M23 is comprised primarily of Tutsis, who were massacred by the Hutu majority in Rwanda in 1994; therefore, the M23 rebels were seen as a significant threat to the wellbeing of the Rwandan government. On a continent where such rebel groups flourish, often unabated by international forces, the prospect of peace after nearly two years of conflict should be viewed optimistically here. Despite the surrender, both parties must still sign a peace agreement, but that is expected to be relatively painless and come sometime this weekend. The question that remains is how Uganda will deal Makenga – turning him over to the DCR would likely result in a death sentence for him, but he may also face war crimes charges at the ICC should he come into their custody. For now, however, this is good news for a wartorn region – news that is rare and should be celebrated as a peace agreement is forged. 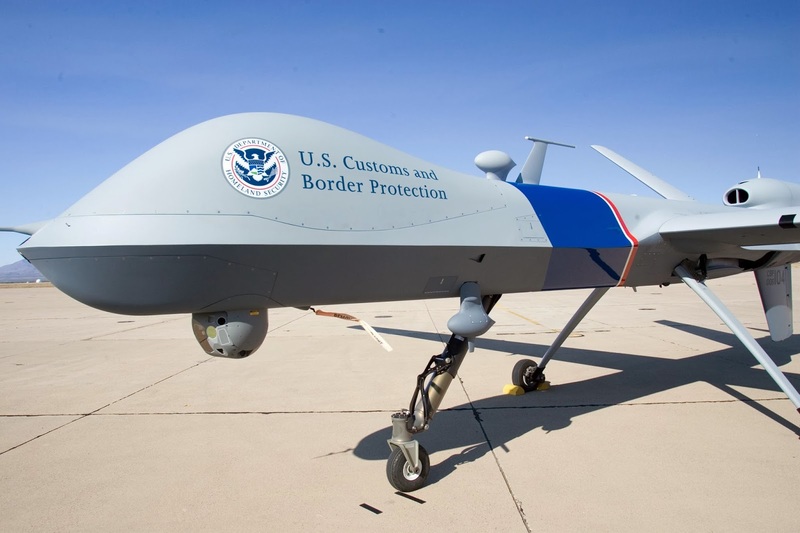 Drones: The Future of National Security Policy? Caught between its purported precision strikes and its murkiness, civilian casualties and contested legality, the U.S. drone program—which largely operates in Pakistan and Yemen—continues to define America’s counterterrorism efforts and its relationships with the rest of the world. Started under former Pres. George W. Bush, the C.I.A.’s drone program has since expanded to include extensive involvement by the N.S.A. and, by 2015, conducting surveillance on American soil. In what first was the centerpiece of weakening al-Qaeda and its affiliates now sits poised to drive the future of national security enforcement. But how effective exactly is our drone program at killing our enemies yet minimizing collateral damage, and do the costs outweigh the rewards? counterterrorism efforts. While official figures are classified, civilian casualties are estimated at between 323 and 372, with approximately 2,864 militants killed. Supporters of the drone program often point to the ‘relatively low’ casualty count as proof that drones are precise and working, all while only requiring a remote operator. No troops on the ground, no funerals for fallen soldiers. Just unmanned aircrafts thought to be best equipped to address America’s diffuse, global threats. Although most Americans and political leaders support the drone program, there are many factors that undercut it. For one, drones operate in all but complete secrecy. As pointed out by recent Amnesty International and Human Rights Watch reports, the lack of transparency and uncertainty surrounding those killed raises suspicions that some drone strikes could constitute extrajudicial killings or war crimes. And without paying meaningful compensation to the families of the deceased, the U.S. risks provoking new enemies in areas we wish to secure and influence for national security interests. Drone use has also become a point of tension between the U.S. and its counterterrorism partners in recent years. Regarding Pakistan for example, drone strikes have thoroughly warped the U.S.-Pakistan relationship. Just days ago, a U.S. drone strike in Pakistan killed Hakimullah Mehsud, the leader of the country’s Taliban branch. Although diplomatic cables show that Pakistani officials tacitly accept and sometimes approve of these kinds of strikes, many publicly condemn the recent assassination as a breach of Pakistan’s sovereignty and territorial integrity in a bid to stir up popular discontent toward the U.S. The duplicity is eroding an already strained partnership, but they do have legitimate concerns about what this means for peace talks between the Pakistani government and the Taliban. Overall, America's drone program is complicating things more than it is making things clear. Questions of legality, possibility of war crimes, and diplomatic complications with Pakistan all pose unique concerns of their own. One thing is clear however: drone use retains strong political and popular support at home, a sign that it might take more than collateral damage and war crimes allegations to force the President and intelligence communities to reconsider drone strikes with an eye to their myriad long-term consequences. This past Friday, the leader of the Pakistani Taliban was killed in North Waziristan, on the Pakistan-Afghanistan border. The United States’ drone program has been under sharp debate for months – proponents see it as a way to wage more specific warfare against American threats with limited civilian casualties and no American troops on the ground, while opponents see it as a power that could be easily abused, and do not agree that civilian casualties are necessarily limited. While the debate rages on, however, the program has not abated, and Friday’s killing was considered a great success. 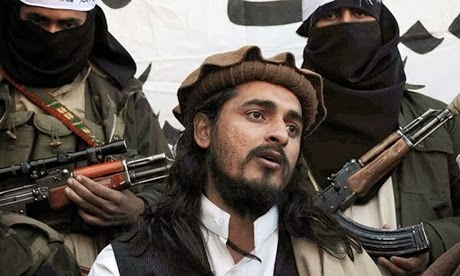 Hakimullah Mehsud, the leader killed, had a $5 million bounty over his head, and was widely thought to be one of the most important figures in the hierarchy of the Taliban. This strike was not necessarily a success, however. Mehsud, who was not exactly a revered figure in Pakistan and certainly not one in neighboring Afghanistan, is now being mourned by the very people who despised him while alive. That the U.S. killed him does nothing but exacerbate our ongoing issues with civilians in the Middle East, who typically view our drone program as too large in scope and unbiased in attacks. In killing a monster, we created a martyr. But civilians discontent with the U.S. may not even be the biggest setback from this strike. Pakistan announced yesterday that they will be “reviewing” their relationship with the U.S., with some politicians going as far as to say Pakistan should block U.S. supply routes to Afghanistan in retaliation. This is not something new, and the U.S. hopefully prepared for this fallout. Pakistan-U.S. relations have been strained for years because of drone strikes liberally executed in Pakistani territory, many of which the Pakistani government has no knowledge of until after the fact. This has sowed seeds of mistrust, and the animosity directed at the U.S. will surely grow with this latest strike. Mehsud’s death highlights the glaring paradox that the U.S. drone program has struggled with since its inception: a successful attack on dangerous insurgents on one hand means those insurgents are no longer a threat to U.S. interest. But on the other hand, how many family, friends, or even bystanders affected by a successful attack will have their minds changed radically enough that they themselves become threats to U.S. interest? It is impossible to quantify this, but it certainly exists. Personally, I support the drone program in a limited scope, and agree that the civilian casualties are almost guaranteed to be less than that of conventional warfare, and that drone strikes limit the number of Americans we need to put in the line of fire. But I do not subscribe to the belief that the drone program works flawlessly. Terrorism will continue to flourish if groups such as the Taliban can continue to portray their fallen leaders as martyrs and encourage civilians to take up the fight on their behalf. To ignore this would be a fatal mistake – the U.S. needs to focus its efforts on combating propaganda in the future just as much as they focus on eliminating these high-profile targets.